A home safe box is a specially designed security equipment to keep its contents safe. Most of them are equipped with some form of secure locking mechanisms. Other than that, they are also usually built using sturdy materials such as iron for added protection against prying. Purchasing and installing a home safe box in Malaysia is one of the most common methods of keeping your valuables safe. An ideal society would be one where cases of theft and break-ins no longer happen. However in reality, such ideal notions are simply not plausible. This is why getting a home safe box can be an efficient way to protect your valued items and important documents. In the event of something unfortunate, a home safe can keep important documents such as birth certificates and property deeds safe from prying hands. At Lion Steelworks, we have more than 30 years of experience in the industry. This makes us one of the most experienced veterans in providing high quality steel products. With such credentials under our belt, trust that we know what it takes to manufacture reliable and sturdy home safe boxes to keep your prized possessions safe. Our Venus Home Safe is meticulously designed to be one of the most reliable home safe boxes you can get in Malaysia. 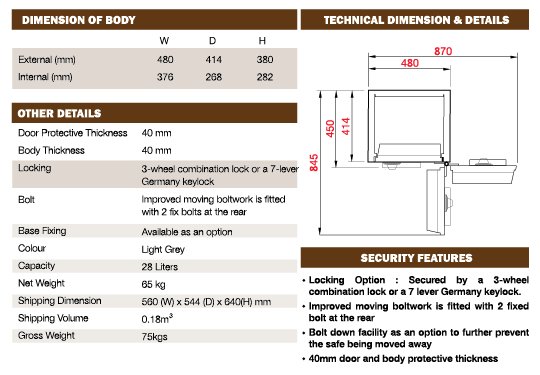 The safe is sturdily built using premium grade steel for durability and strength. With a 40mm thickness, your items will be safely secured with our Venus Home Safe. Available in either a 3-wheel combination lock or a 7-lever Germany keylock, either configuration will make sure that only authorized individuals can get access into its contents. Coming in at 480W x 414D x 380H (mm), the safe is small enough to be conveniently placed in any concealed location while still having sufficient capacity to keep most of your valuables. With secure bolting options, you can be sure that no petty thief will be able to simply walk away with your safe. With Lion Steelworks, we aspire to provide the best home safe box in Malaysia. The next time you are looking to keep your family heirloom or jewellery safe, Lion Steelworks may just have the solution for you.